Match 63, To summarize in one word – Adam Gilchrist. That’s all i got to say as one man decimated a team which won 7 games in a row. After winning the toss Gilly decided to bat first, after 6 overs, KXIP were 30 odd runs after losing Valthaty. this is the time one of the world’s most destructive batsmen found his best form. Gilchrist blazed away the RCB bowlers all over the Dharmasala stadium, on one occasion he went for the mountain which went 122 meters long. Shaun Marsh also joined the party along with Gilly as both played some kind of PS2 cricket as they smashed ball after ball. Gilly finally scored his 2nd IPL century, and Marsh was not out for 79. KXIP ended with the tournament’s best score of 232/2. One of the best start needed for RCB if they have extend their winning streak, but it did happen opposite as Gayle played a maiden before getting out for a duck. From then on few played shots then and there but nothing seems to match the run rate as it was always in the Dharmasala mountains. Far away to the reach for any team. Finally KXIP bowled out RCB for the first time in this season and winning the match by 111 runs. – One of the Gilly’s six went past the mountains of Dharmasala as long as 122 meters, which is also the longest for this tournament. – Adam Gilchrist scored the second century in the IPL; he is also the second player after Chris Gayle to achieve this feat. – Adam Gilchrist’s first six of the day was also his 100th T20 international six. – 232/2 is the third highest ever score in IPL history; list is topped both times by Chennai with 246 and 240 Vs Rajasthan and KXIP respectively. – Gilchrist’s catch of AB de Villers’s is the 50th dismissal in IPL so far. – KXIP’s massive victory also ended the seven match winning streak by Royal challengers Bangalore. – 27 extras bowled by Bangalore are the highest ever in this season, Kochi will be happy to leave the position after bowling 23 extras. – This is the first time RCB’s have been bowled out in this season. – Praveen Kumar bowled the 27th Maiden of this season, also personally 7th for this season, highest by anyone so far in IPL. – Piyush Chawla became the 12th bowler to pick 4 wickets are more in this season of IPL. – 206 runs partnership between Shaun Marsh and Adam Gilchrist is the highest ever for any wicket in IPL and even for T20 internationals. – 206 runs partnership bettered 152* between Kallis and Gambhir for this season of IPL. – 206 runs partnership bettered 186 runs between Justin Langer and Cameron White for Somerset vs Gloucestershire in 2006. – Gilchrist is also the 13th player to score 2 centuries in the T20 Internationals. – 111 runs victory is the second highest margin in the IPL history as the KKR still tops with 140 run victory margin vs Bangalore in the first season, and for this season this is the highest bettering 85 runs margin by RCB themselves against KXIP. – Rajasthan Royals lost their 4th game in their home ground for all the four seasons of IPL played. – Shane Warne picked up his 7th Duck in his IPL Career, highest by any player in IPL. – Today’s longest six went for 103 meters and it came from the bat of Mr. Dhoni. 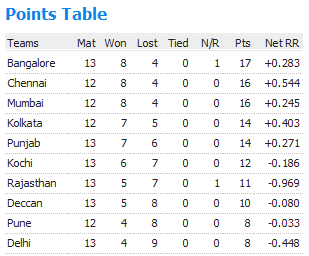 – 196/3 is the highest total for CSK of this season; previous best was 188/4 Vs Punjab which they actually lost. 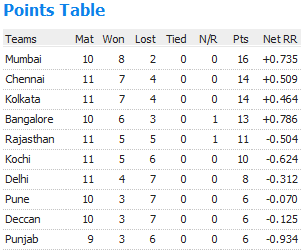 – 63 runs victory margin is the second highest of this season, next to 85 runs victory from Bangalore over KXIP. – Royals are bowled out second time in this season; previous was with Kolkata where they bundled out for 81 runs in 15.2 overs. – Murali Vijay scored the seasons second and overall his seventh IPL fifty. – Rahane scored his Maiden IPL Fifty for Rajasthan Royals.